The fiery river of Hades in Greek mythology, mentioned in Plato's "Phædo," 113a, which figures also in Jewish eschatology. In the Sibyllines, i. 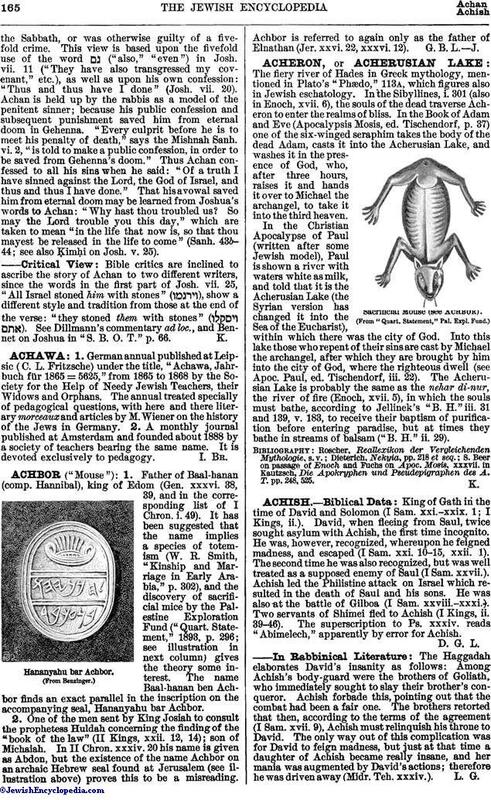 301 (also in Enoch, xvii. 6), the souls of the dead traverse Acheron to enter the realms of bliss. In the Book of Adam and Eve (Apocalypsis Mosis, ed. Tischendorf, p. 37) one of the six-winged seraphim takes the body of the dead Adam, casts it into the Acherusian Lake, and washes it in the presence of God, who, after three hours, raises it and hands it over to Michael the archangel, to take it into the third heaven. In the Christian Apocalypse of Paul (written after some Jewish model), Paul is shown a river with waters white as milk, and told that it is the Acherusian Lake (the Syrian version has changed it into the Sea of the Eucharist), within which there was the city of God. Into this lake those who repent of their sins are cast by Michael the archangel, after which they are brought by him into the city of God, where the righteous dwell (see Apoc. Paul, ed. Tischendorf, iii. 22). The Acherusian Lake is probably the same as the nehar di-nur, the river of fire (Enoch, xvii. 5), in which the souls must bathe, according to Jellinek's "B. H." iii. 31 and 139, v. 183, to receive their baptism of purification before entering paradise, but at times they bathe in streams of balsam ("B. H." ii. 29). S. Beer on passage of Enoch and Fuchs on Apoc. Mosis, xxxvii. in Kautzsch, Die Apokryphen und Pseudepigraphen des A. T. pp. 248, 525.